Gräciõ's LäveñderBliss Café: Been a long time since I ate fish!!! Yesterday, I went down to the supermarket (Spinneys) opposite my place. Usually, Spinney's fishes are quite lousy and always never fail to have fishy smell. Pork is ex here and so is fish. Chicken is usually in our everyday meals. Be it lunch, dinner or supper, U will see chicken on our dining table. But we're never tired of it. Hehe.. Back track now, yea, so yesterday, feel like eating fish out of the blue. So pass by the "seafood" section & saw King Fish Steak. The fish looks fresh & meat is soft. So I decided to buy 1. Told myself to give Spinneys a chance to prove their fish to me again for the 10th time. Hehe.. And yes, i bought it. Then, I went to the vege section to get some leeks. I like leeks. 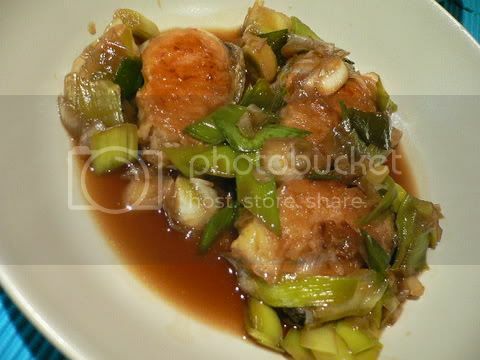 My mama used to make simple leeks dinner for my papa n me. She loves to attend community cooking classes as they are conducted in chinese. Not all the time she can catch wat the teacher is talking about but at least she tries. Now she's improving but she still prefers to eat out. Oke, here's the dish that I made yesterday. Another recipe by a member from KC. 1. Marinate fish head with marinate. 2. Deep fry till crispy and golden brown. 3. Arrange it on a deep dish. 5. Add leeks to stir fry till soft and cooked. 6. Add rest of seasonings to cook till well mixed. 7. Pour hot sauce and leeks over fish, serve immediately.